The rest of our trip down the west coast of Vancouver Island was a mix of secluded anchorages, quaint towns and new friends. The Bunsby Islands, Dixie Cove, Young Bay and Barkley Sound provided our last few bits of isolation. Winter Harbor, Walters Cove and Zeballos gave us a chance to stretch our legs, chat with the locals and make some new friends – after meeting the three amigos on M/V Carisma, they were a common sight at several of our anchorages down the coast. Tofino was a great blend of surf town culture with a bit of cosmopolitan thrown in, mainly by way of cuisine and brew. Our last night was spent in Oak Bay at a popular marina in a relaxed suburb on the east side of Victoria, BC. The next day, as we rounded the corner of San Juan Island toward our Customs clearance in Friday Harbor, we felt a good dose of culture shock seeing the sheer number of boats in the area. After a quick check-in we motored through the islands, crossed Rosario Strait, passed under Deception Pass bridge, and grabbed the mooring ball directly in front of our house. We were home… for now. SE Alaska is amazing and absolutely exceeded our expectations. Wags’ interpretation of comfortable wave height was somewhat skewed by 24 years in the Navy and many days at sea on ships much bigger than 48 feet. Ten-foot seas on an aircraft carrier are NOT the same as on Gadabout. His meter has been recalibrated. Capes are the real deal (see “Respect the Capes”). We will experience many more in the years to come; now we know what to expect. The life expectancy of electric pumps is approx. 8 years (We replaced three on this trip). Any docking you walk away from with no new scratches on the boat is a good one. Rafting to other boats is NOT a good idea in a strong current, although our de-rafting “challenge” gave us a good excuse to buy a new grill. Surfing tidal rapids is one of the coolest things ever (see “Surfing in Alaska”). Paula needs a bigger lens. Our depth finder is schizophrenic. At one point, our 6-ft keel should’ve been 3 feet in the mud according to its reading. New experiences are made even better when shared with friends. This is one we already knew but it’s worth repeating. 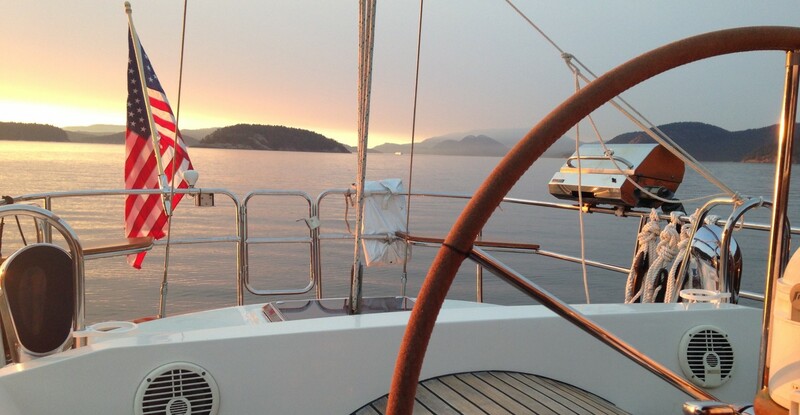 We look forward to sharing more of our sailing adventures with friends along the way. We swore we’d never navigate by a cartoon map. This typically applies to tourist maps (i.e., don’t walk toward the big cartoon beaver to find the river). Now we do it on a regular basis – our electronic charts are a significant aid in our navigation. That said, if you unexpectedly see the bottom, STOP. We are thrilled with Gadabout’s seaworthiness and level of comfort, and we are ready to take her around the world. We can spend at least 89 days together and still be ready to continue the adventure. We probably learned more lessons but in the interest of not revealing the most embarrassing ones and not boring our readers, we’ll stop here. Stay tuned… the adventure continues in September when we head south toward Mexico. I love the what we’ve learned idea. Man, I’m sure by now you could fill pages. Enjoy those teachable moments…when when it’s after the fact! Congratulations on such a spectacular trip, and thanks for letting me come along vicariously. I look forward to Mexico!